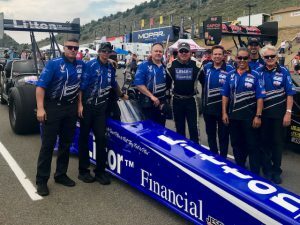 The 39th annual Dodge Mile-High NHRA Nationals powered by Mopar kicked off last weekend at the beautiful Bandimere Speedway in the Rocky Mountains of Colorado. 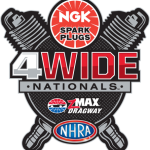 The Mile-High National competition is the largest motorsports event in a 5-state area. 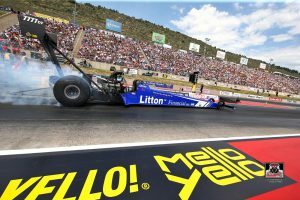 Fans from around the West Coast were ready to witness these incredible cars burn up the track at speeds upwards of 300 mph and Team Litton came ready to give them a show. 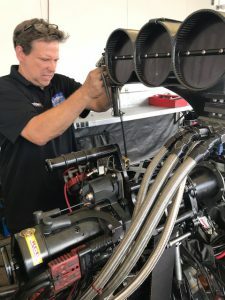 Once again teaming up with Worsham Racing, Driver Bill Litton was competing in the Nitro Top Fuel division. 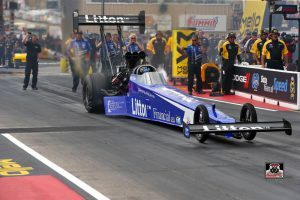 Driver Litton made his Top Fuel debut at this exact event with Worsham Racing back in 2016. The Western Swing is where it all started for this partnership and they arrived last weekend with more experience under their belts, ready to compete. Per Driver Litton “It’s a good weekend for us to work on some quirks and get ready for the rest of the season. I’m going to try to run as many events as I can and keep working on this deal”. Co-Crew Chiefs Del and Chuck Worsham with crew members Mike, Deron, John, Jacob, Jimmy and Glenn arrived at the track with hopes to launch deep into the field for a great qualifying position. Friday brought the first round of qualifying runs and the plan was to hit the ground running in a Q2 night run. The team never got a shot at that run on Friday due to a bent valve, caught just before the warm up. “The guys were just lashing the valves before we started it when they found it”, said Litton. All dressed up, and nowhere to go on a Friday night for this team. It was back to the pits to work on the car. They would have to wait for the next day to get a piece of the action and face the heat in the day runs. “When you race in the mile-high air with 100-degree weather it brings very challenging conditions. Just like we’ve had all summer”, said Chief Worsham. Litton made his first pass of the weekend in Q3 with 4.28 @218 mph, enough to get them into the elimination rounds. Driver Litton was on a great pass until just about half track. Per Chief Worsham, “First round of qualifying Bill drove the car nice and straight, but we had a little problem with the cylinder head which shot off some fire”. 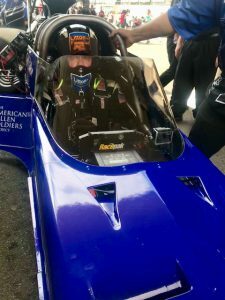 The run moved him into the elimination rounds holding steady in the 14th slot. E1 brought Driver Litton up against points leader Steve Torrence. Litton is the 50th driver to face him in eliminations. Litton had cylinders out right at the hit & the chutes were out by half track. 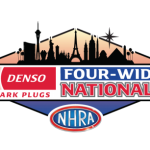 “We didn’t quite get the job done here in round one against a very tough competitor, Steve Torrence, but next we are back in California where we are all from and where we want to be”, said Chief Worsham. “The air and track conditions will be great. We want to use Sonoma as a building block and hopefully bring home a win in this Mellow-Yellow Series. The Mile-High fans were awesome and this is a beautiful facility. 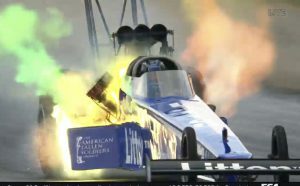 It was a lot of work, but we had a lot of fun also”, said Worsham. Next stop for the Western Swing we are back in California in beautiful Sonoma County. 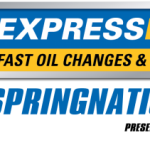 The team will be competing once again in the Top Fuel Division kicking off July 26th at the Sonoma Raceway. 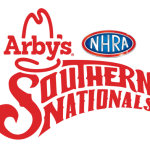 Be sure to check in on Social Media for live updates from the track. If you are interested in learning more about how you can be a part of the action and would like information about marketing partnership opportunities, please contact us at info@littonracing.com. 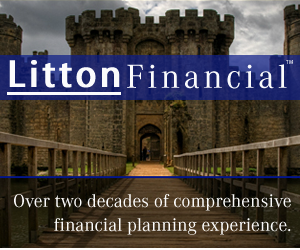 For insider updates and exclusive videos and photos, make sure to follow us on twitter, like us on Facebook, follow us on Instagram @litton.racing.